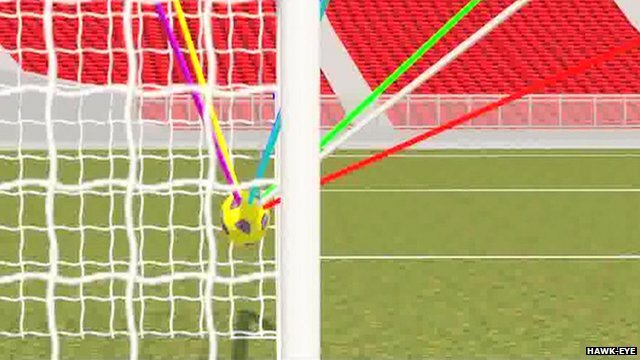 Is Goal Line Technology really necessary? Last Saturday in the Premier League, there was a game between Reading and Southampton. This was a game with huge implications for the Premier League relegation battle, with Reading bottom of the league and Southampton still not out of danger. With about 15 minutes to go in the game, with Southampton leading 0-2, Reading’s Adam Le Fondre headed the ball at goal. Southampton goalkeeper Artur Boruc ended up turning what should’ve been a routine save into a drama, by stumbling backwards and appearing to carry the ball over the goal line. The assistant’s flag didn’t go up, so a goal wasn’t given. A goal being awarded could’ve led to Reading, who’ve had a habit of scoring late goals all season, coming back to win the game, which could’ve changed the shape of the relegation battle. Potentially, there was millions of pounds of TV revenue for several clubs riding on that decision. So, it’s fair to say that it was a big call that had to be made. To the credit of the assistant referee, replays showed that he got it right, with the whole of the ball not crossing the line. From next season, the officials will no longer have to make that call, as on Thursday, the FA and the Premier League announced that as of next season, goal-line technology (GLT) will be available for use in every Premier League game, as well as FA Cup games played at Wembley and Premier League grounds. This makes the Premier League the first major league to use GLT. La Liga says it plans to introduce it in two years, with the Bundesliga also planning to introduce GLT in the near future. There has been a clamour for GLT to be introduced for years now. In the last World Cup, England were denied what would’ve been an equalising goal against Germany when Frank Lampard’s shot was incorrectly ruled not to have crossed the line. FIFA were resistant, but when Ukraine’s Marko Devic had a goal incorrectly ruled out against England in EURO 2012, even Sepp Blatter got on board the GLT train. The Premier League has picked Hawk-Eye, a camera-based system which is currently used in Tennis and Cricket, ahead of the GoalControl system FIFA recently chose to be used in this year’s Confederations Cup and next year’s World Cup. So before next season, every Premier League club will have to pay up the estimated £250,000 it will cost to install the necessary cameras that Hawk-Eye requires as well as the thousands it costs to operate the system every game. Premier League Chief Executive Richard Scudamore said “The Premier League has been a long-time advocate of Goal-line Technology, and at times it didn’t look like it would be something we would be able to introduce. “However, since FIFA took the decision to permit it we have been working hard to get a system in as soon as practically possible. England manager Roy Hodgson said of the decision to bring in Goal-Line Technology: “It’s something people in football have wanted for a long time, and for a while it was pushed back, but it’s great to see everyone’s on the same page and it’s being introduced. “I’m looking forward to that, and at least it will stop some of the gross injustices we’ve seen in recent years, where goals have been scored and not allowed. Once again I seem to be diametrically opposed to popular opinion in that I’m not in the least bit excited by GLT, and I don’t think it’s a positive step. It’s not the remedy to all of footballs ills that people seem to think. It’s actually an expensive, over-engineered solution to a problem that rarely arises. I’ve stated in the past that I’m against the use of technology in football. Mostly, this is because one of my favourite things about football is that it is a sport that flows, rather than being stop-start. I believe that it is the flowing nature of the game that sets it apart from other sports, and if that’s lost, which I believe would happen if replays were introduced; the sport would be much poorer for it. I concede that won’t be an issue with the introduction of Hawk-Eye. In cases where Hawk-Eye is needed, the referee will receive the relevant information within a second, so I’ve no complaints on the grounds that it’ll slow the game down too much. However, I have several issues with the introduction of Goal-Line Technology. Firstly, and this is the big point, is it really needed? Incidents such as the Frank Lampard goal at the last World Cup or Ukraine’s non-awarded goal at EURO 2012 are rare. Richard Scudamore claimed that there have been 12 incidents that GLT could have been used for already this season. I really doubt it’s that high (and short of going through every game there’s no measured stat for it that I’m aware of), but let’s use his number. At the time of writing, there have been 321 Premier League matches played this season, which means that GLT could have been used on average once every 27 games. So it’s hardly an endemic problem is it? Add to that the fact that, for all the anecdotal evidence to the contrary, Premier League referees are actually really good. Figures compiled by the match delegates, who assess the performance of referees and assistants, show that Premier League referees get 92% of their decisions right. For assistants, who are the ones usually responsible for judging if the ball has crossed the line or not, that figure rises to 99.3%. Going back to those 12 incidents that GLT could’ve been used for, and let’s be unkind to the assistants and say they were right 75% of those decisions. That would mean that of those 12 incidents, only on 3 occasions would GLT have given a decision different to the assistant referee. That’s an average of 1 decision every 107 games where GLT would be more effective than the human system in place now. So is it really a problem that needs solving? Especially with an expensive system? Then there’s the cost effectiveness of the system. As I mentioned earlier, Hawkeye will cost a considerable amount of money to install and operate. Financial Fair Play regulations (the Premier League ratified a motion to implement a watered-down version of UEFA’s FFP rules this week) mean that clubs are more conscious than ever about their bottom lines. This means that ultimately the fans will pay for Goal Line Technology through increased ticket prices. Ticket prices are so high, especially at the bigger clubs in the Premier League that they are beyond the affordability of many people, especially younger fans. This means that increasing ticket prices further will only drive more people away from attending matches, which hurts the game long-term. GLT is also, in my opinion, intrinsically unfair. One of the fundamental principles of football is that there is supposed to be universality within the game. This means that the game is supposed to be the same whether you’re playing in the Champions League final at the Santiago Bernabeu or in an amateur game on a dusty field in Kenya. The cost of implementing GLT is prohibitive to anyone but the elite leagues, so that universality is ruined. In fact, there won’t even be universality in the same competition. GLT will be used in the FA Cup from the third round, which is the round Premier League and Championship clubs enter. Theoretically, there could be a situation where you could have two games in the same round, one at a Premier League ground, one at a lower-league ground; and in each game there’s an incident where GLT would be needed. Only in the Premier League ground would the technology be available, so the teams in that game have an advantage over the teams playing in the GLT-less ground. That’s just unfair. My final objection is that the ball crossing the line is only one factor in judging whether or not a goal should stand. This week in the Champions League match between Borussia Dortmund and Malaga, both teams were awarded goals that should’ve been disallowed for offside. GLT can’t do anything to prevent that happening again. Had the incident that got Blatter on board, Devic’s disallowed goal for Ukraine, been subject to GLT, it would’ve been awarded. But in the build-up, Artem Milevskiy, who set Devic up, was offside, so GLT would’ve led to the wrong decision being made. At present UEFA have no plans to introduce GLT, and similarly Italy’s Serie A say they’re not considering using it. Michel Platini estimates that to use GLT across European club competitions would cost a total of $71m over 5 years and says that’s just not cost-effective. GLT has arrived and I can only hope that it doesn’t mean that Pandora’s Box has been opened when it comes to technology in football and that video replays won’t arrive soon afterwards.